Goerlich Quadruplets: Yippee, Daddy's Here! Chris finally made it! I picked him up from the airport and we grabbed lunch while the babies were down for a nap. When we got back he surprised them by sliding down the stairs to where they were playing. I don't think the babies recognized him at first but after a few hugs and raspberries things were back to normal. We have been busy the last few days enjoying all of the family time and beautiful weather. 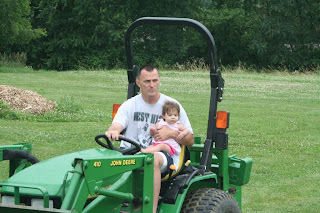 On Saturday, we once again had Olympic fever so we created our own family Olympic events. 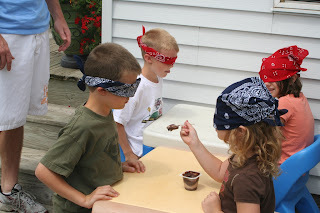 We had a blindfolded eating contest, an obstacle course, shooting event, family trivia, treasure hunt and more. It was a blast for everyone. That evening we got a babysitter and the adults went out for a wonderful dinner at Vino's. Our First Olympic Event - Team Red Took the Gold! 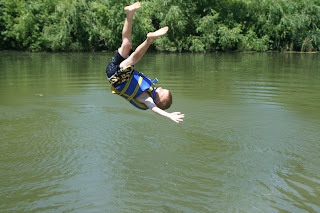 Sunday we did a little fishing, canoeing, and cannonballs into the pond. We topped the day off with Grillmaster Glass throwing some ribs and burgers on the grill and what bar-b-que would be complete without Iowa sweet corn! We'll be flying home soon and are praying for an uneventful day...but either way, we'll keep you posted on all the travel entertainment that our family is sure to bring to the skies this week! Lots of love from the Heartland! Glad the kiddos are back and happy with Chris! Dads have a special place inside kiddos hearts! Yeah-all reunited and having fun! What great memories everyone will have of this time together. Praying for safe travel home and happy babies. Enjoy every single moment. It sounds like you are having lots of fun! Have a safe trip home. I have to tell ya - you are killing me with the sweet corn talk. I was born and raised on that corn! Well, the corn and the tomatoes, melon and rhubarb pie. Do you think you can bring a big box of it all on the plane with you and drop it over Dallas when you fly by? Ok, probably not. Wishful thinking! Anyway, hope the rest of trip goes great. Glad you are all back together again! Glad you are all together . Have a safe journey home! SO I know 2 and under fly free, but do you get them all free or only 1 free for 1 paid adult, so therefore you have to pay for 2? Like if one of you were to fly alone with all 4 (Which may be phyically impossible) would they all still be free? Just curious!!!! Glad ya'll are having a nice time!!! Hi! My name is Tamara, the mother of an 11 yr old boy, Mason and 17 month old b/g twins...Trinity and Morgan. I love reading your blog (still reading in 2007 posts). 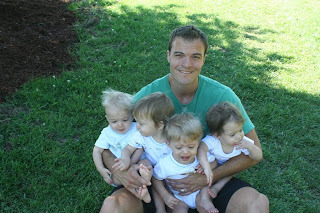 I just found it through a trail of blogs :-) Twinfatuation then through the Gibson Twins. Your blog name sparked my interest because my best friend has 8 year old quads! I will continue to read your updates and love that you know Jesus too! Anonymous - unfortunately, we do have to pay for 2 babies when both Mari and I fly. We are allowed one baby per lap and the others have to be in a car seat with a paid ticket. Traveling will be quite expensive for us I'm afraid:( Thank you for your question.